Commonly used for: Excellent Credit, No Foreign Transaction Fees, Rewards, Sign-up Bonus, Travel. If you’re OK with redeeming rewards for airfare through the card’s travel portal, the Citi Premier℠ Card provides excellent value. With wide definitions for what qualifies as travel and entertainment, faithful users of the card should be able to score free flights fast. Plus, this card boasts a sign-up bonus of 50,000 points after you spend $4,000 within the first 3 months. But if you value maximum flexibility over rewards-earning potential, this may not be the best card for you. 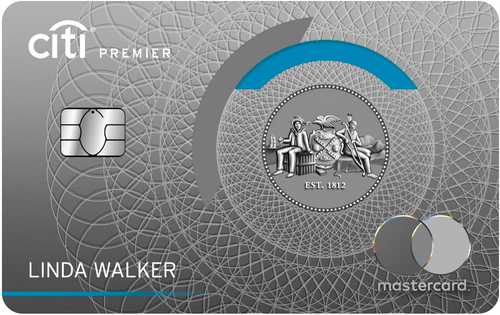 The Citi Premier℠ Card suffers from mood swings. This card’s appeal improved greatly when Citi boosted the sign-up bonus in 2017. That move alone pushed this card into the top tier of travel rewards credit cards, especially considering its modest (in comparison) annual fee. Citi then killed the bonus in September 2017, brought it back in January 2018 but at a lower rate than the original offer and then as of August 2018, after you spend $4,000 in purchases within the first 3 months of account opening you can earn 50,000 points that can be redeemed for $625 in airfare on any airline, anytime with no blackout dates when booked through the ThankYou® Travel Center, or $500 in gift cards when redeemed at thankyou.com. When it’s not offering a sign-up bonus, this card may seem less appealing than one that offers an initial bonus, but anyone who spends a decent amount of time in their car will likely get more value over the long term from a card that pays big rewards on gas, parking and tolls. It’s worth noting that at 3x the rewards, this card pays as much on gas spending as some of the best gas credit cards on the market. If your primary objective is to earn rewards toward air travel and you don’t mind booking your flights through the Citi ThankYou portal, you can benefit from owning the Citi Premier℠ Card. Earn 3 ThankYou Points for every $1 spent under Citi’s broad definition of what counts as travel. Gas stations, parking garages, tolls and even travel agencies will all net you triple rewards. And, downloading music, going to a sporting event, or a movie all count in the entertainment and restaurant categories, which earn 2 ThankYou Points for every $1 spent. All other purchases earn 1 point. We are disappointed this card has a smaller sign-up than other premium rewards cards. Other travel rewards cards offer this perk. Frequent air travelers who aren’t loyal to a particular airline stand to gain the most from owning this card. The Citi Premier℠ Card has a generous rewards structure, especially on gas travel purchases. Points gain 25% in value when used to book airline tickets through the Citi travel portal. The card comes with Citi Price Rewind and some travel insurances and benefits. Best ever sign-up bonus for this card right now. You can only transfer points to a select number of airline partners and only one hotel chain. The best value comes from booking through the Citi site, where points are worth 25% more, but this can be limiting as not every airline or hotel are listed in the portal. Smaller sign-up bonus than other premium rewards cards. There’s no introductory APR offer on purchases or balance transfers. The annual fee of $95 is waived the first year. The APR on purchases and balance transfers is a variable 16.74% – 25.74%. There are no foreign transaction fees on purchases made outside of the U.S.
There’s a penalty APR of up to 29.99% variable that may apply indefinitely after one late or returned payment. Plus, a late payment fee of up to $39 may apply. Cards for authorized users are free. This card has Citi Price Rewind price protection, which may help you get a refund on the price difference if an item you purchased is found at a lower price within 60 days of the initial purchase. Cardholders also can get pre-sale access to purchase select event tickets. The card also comes with trip and luggage insurances as well as access to emergency and auto protections and concierge services. Citi ThankYou points are worth 25% more when redeemed for airfare through the ThankYou website. You can also redeem points for gift cards and merchandise, but you’ll forgo the points bonus afforded travel redemptions. You can transfer your points to participating airline partners and there’s no fee to redeem them. You can find further information on the rewards structure of the Citi Premier℠ Card by visiting our Citi ThankYou Points Rewards guide.